If your seat has an integrated/non-adjustable headrest start with 1. If your seat has separate/adjustable headrest start with 2. Remove the headrest from the seat completely. Some headrests have a button located under the headrest. Push the button in and pull the headrest upwards to remove it. Other vehicles will have a pin that needs to be pushed out to allow the headrest to be removed. Fit the headrest cover over the headrest and fasten the fabric ties together. Do not refit the headrest to the seat just yet, keep on the side. Place the seat cover over the back of the seat and pull down firmly, straightening the cover for a tight snug fit. If your seat has any armrest, feed the armrest through the cutout provided on the seat cover. Push the centre ties through between the seat base and backrest so they can be tied underneath the seat. Where there is carpet on the back of the seat restricting access through the seat, push the ties through the corner of the seat back and base. Run the ties on the outside of the seat cover base and tuck in behind the plastic side cover of the seat and bring it under the seat just above the seat rail. The seat cover is held in place by the ties. Fasten all ties to each other. Once the seat cover is fitted correctly, refit the headrest (if applicable) to the seat and push down so that the headrest retracts to its original position. If your seat has any armrest, place cover over armrest and fasten ties. Seat covers have Deploy Safe seams on either the left or right hand side of the seat cover. 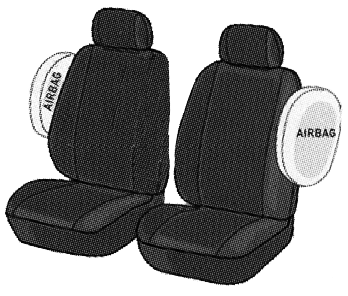 Ensure that the Airbag label on the seat cover is on the outside of the seat facing the door. Passenger seat cover must also be fitted the same way.